AllegroMedical.com presents The Conveen Security+ Contoured Leg Bags. 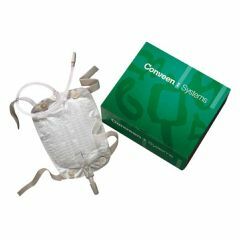 Conveen Contoured Urine Bags feature unique internal chambers that fill quietly and distribute urine evenly for optimal discretion. Katex-Free, lightweight leg bag includes pre-attached, adjustable, anti-kink tubing, soft cloth backing, anti-reflux valve, and center weld for even distribution of urine. Disposable. I get 2-3 weeks of daily use of this bag. Attached extension tubing. Lightweight. Easy Storage. Sturdy. Safe. soft backing material. inner channels . drain lays flat. great leg straps included. wheelchair athlete. Elderly. Following Surgery. long term use. any leg bag user. superpubicic catheter. Long term foley user. INCOMEPLETE QUAD. PLEASE make with the ribbed tubing! PLEASE start making these bags with the ribbed tubing that is on the other conveen leg bags! The leg holder strap that goes around the tubing to hold everything in place around your thigh slides on the tubing wo/ the ribbing. This allows the condom catheter to be pulled on and come off it it inadvertently gets yanked. The length of the ribbed tubing was better also--a bit longer. I've been buying this product for years. Lightweight. Great for hot weather. I've been using this product for several years now for my husband. It is especially great having the cloth backing and cloth straps in a hot climate. Has anyone else had the bag burst at the side seams? This happened to 3 out of 4 bags in our last order and we are wondering if we got a bad batch or it was just human error, i.e. we should have emptied it a few ounces earlier. What?? Can you rewrite your question and I will be happy to assist you with the products I use but I'm not sure of your question. Somewhat confusing. I've been using Conveen Leg Bags for years. I am a parapelegic and find the closure clasp easier to use with disfigured fingers. Thank you for a quality product at an affordable price. This is the best bag that my husband has used. Especially due to our hot summers the cloth back makes it extremely comfortable. As to the hard drain, this bag is more flexible than most and is extremely easy to empty without having problems.Would recommend this product above all others.